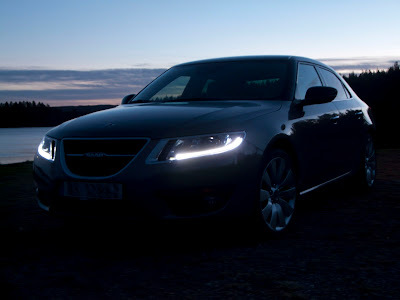 On request, here's how the night panel on the new Saab 9-5 looks. Move the mouse courser over the image to turn on night panel. The Night Panel was first introduced in the new Saab 900 for model year 1994 as the Black Panel. It changed name to Night Panel in the 9-3 and 9-5. 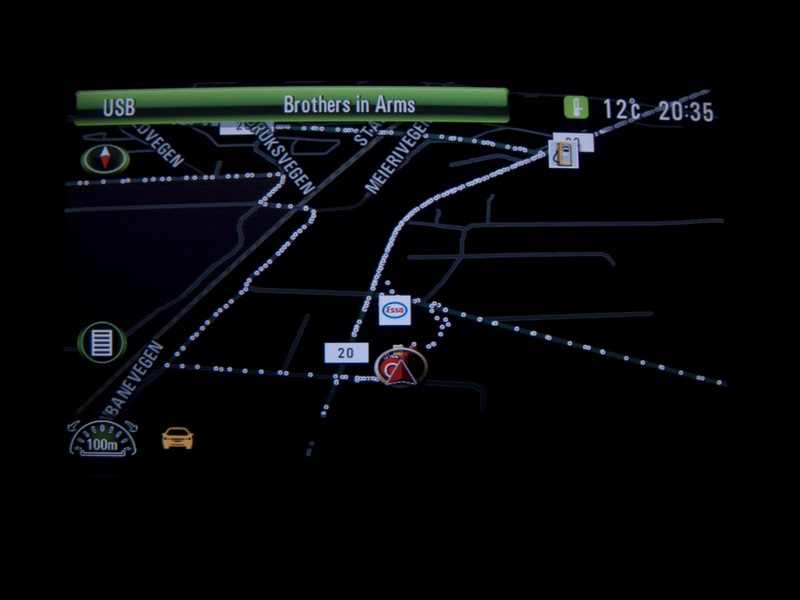 This cool and helpful feature when driving at night, has been beloved ever since introduction. No, I didn't hit a moose, but my sisters fiancé did with their 2001 Saab 9-5 SportCombi. He wasn't going very fast, maybe 40 km/h when he hit the moose, but when you get 500 kilograms of moose on the hood and into the windshield, it is still noticeable! Today I went to wash my car. After the car was sparkling clean, I was ready to leave the wash bay. I sat in, pressed in the clutch and pushed down the start button. Nothing happened. I pushed the button again. Still nothing. The only bright symbols on the dashboard was the parking break icon and the engine icon. By this time I was getting a bit bewildered. I got out of the car and tried to lock the car hoping that locking the car would turn off and reset all systems. But the car couldn't be locked. Standing outside my car I noticed that the car decided to turn on the lights. I got back in and tried to start it again. No reaction. But now there was some message about the remote key. I was too confused by the whole situation to notice exactly what the message said before it disappeared. 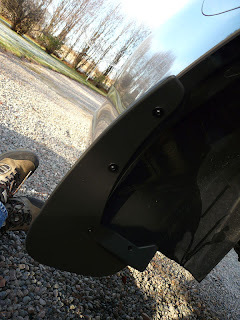 But the message made me suspect that the immobilizer was stopping me from starting the car. I decided to pop up the hood and see if I could disconnect the battery and thereby reset the car. 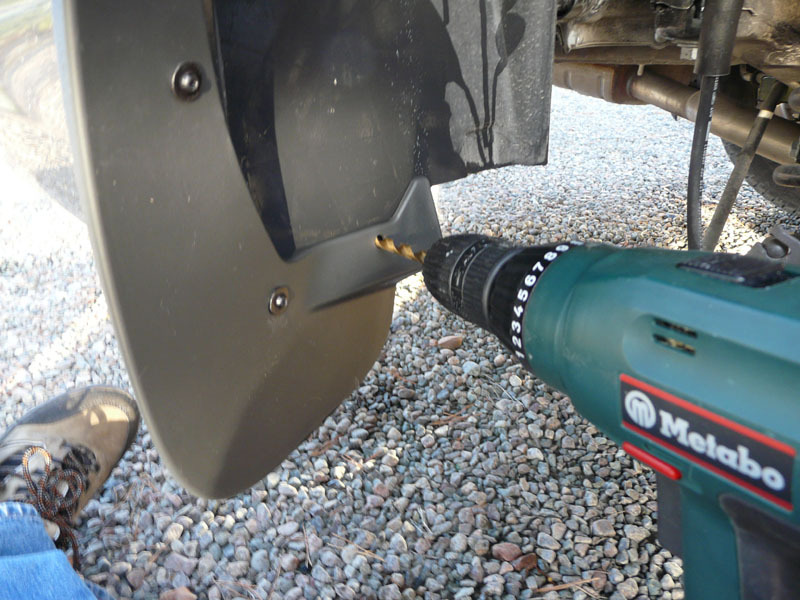 But I did of course not have the needed 10 mm wrench to unhook the battery's ground cable. By this time there was a queue forming behind me, so I asked the next in line if he could help me push the car out of the wash bay. When we got the car outside I got back in and sat there for a few seconds. Then suddenly all the LCD-screens went black. I pushed the start button. Brooooom. It started! And I drove off. This experience took a chunk of the trust I had in my car. 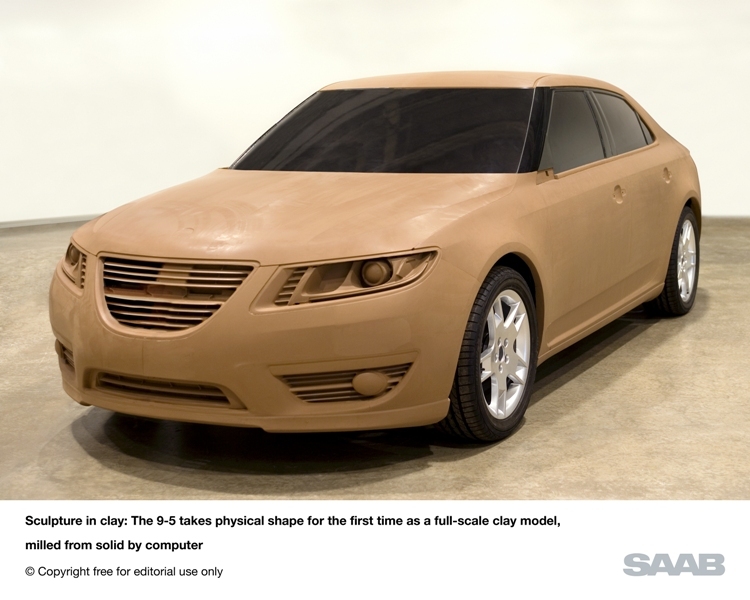 And it was really bad advertising for Saab that I couldn't start my brand new car and we had to push it out! I hope I'll never need to experience that again. 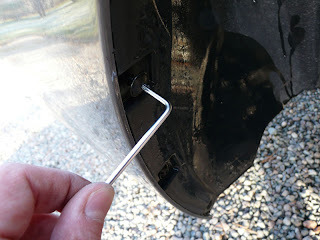 But just in case, I will keep a 10 mm wrench in the clove compartment. 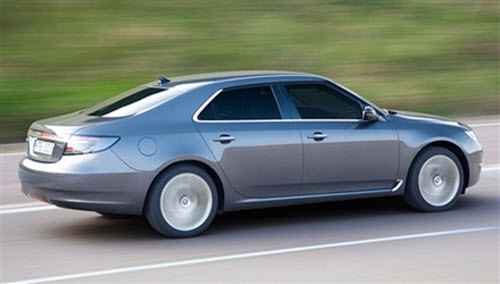 So you think the previous generation 9-5 looks terrible with the chrome frames around the headlights? 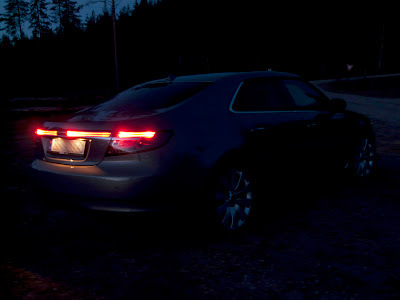 And the wide black lines framing the "frosted" white tail lights on the 9-3 Sedan aren't much better? Then lo and behold, they are both present on the new Saab 9-5! 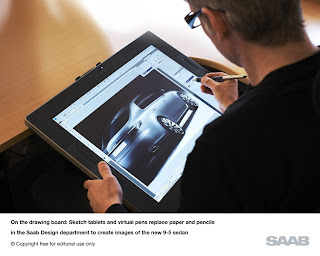 But I guess one can argue that the use of chrome and black frames are much more sophisticated and subtle on the new 9-5. 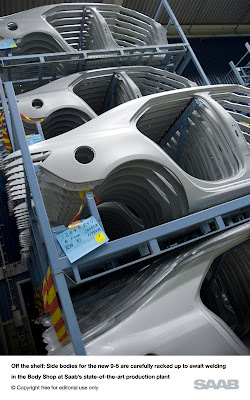 The frames around the headlights use matt chrome and are integrated into the rest of the grille, while the black edges on the rear lights are barely visible. Do you still not like chrome and black frames? 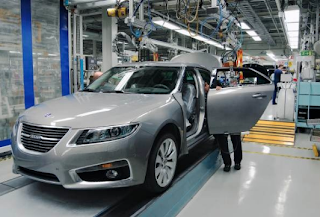 Would you like to get a photo book with your new Saab? Several months ago I got an idea how Saab, with simple means, could strengthen the bond between the Saab owner and his new car and subsequently between the Saab owner and Saab Automobile AB: Make a unique photo book of every car manufactured and include it with the car! The book could cover the design and development of the model, as well as the production and assembly of that specific car. But why the photo book in addition to this? Well, because a photo book is a lasting memory. You can turn the pages and look through the photo book when you get the car, one year later and ten years later. You can have it on the book shelf, on the coffee table or on the bedside table. You can keep it as a memory when you sell the car or you can send it along with the new owner. So Saab, why not contact an international photo developer and make a deal? I am sure that there are one or more photo developers who would set up a server where Saab can upload the pictures and where the Saab buyer can log in (with a code that comes with the car) and order a pre-setup photo book for free. If the developer has the chance of getting up to 125 000 new customers each year from this deal, then I bet the company will give away a free photo book to the new customer! Page one: Maybe a picture of Jan Åke Jonsson and a "personal" message from him? And then some blank pages where the owner can put in his own pictures. Yesterday I bought the winter tires I mentioned in yesterdays entry. In Norway it's not just recommended that you use winter tires during the winter season, it's also mandatory. That means that we have to have two wheel sets. 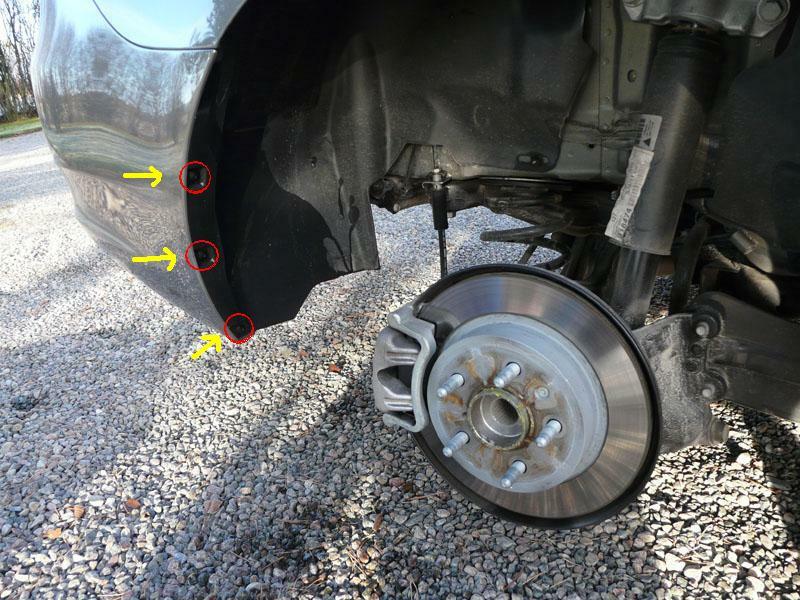 Therefore I got the Turbine wheels to use in the summer season and for the winter season I will use the Blade wheels that came with the car. For winter tires I got the Nokian Hakkapeliitta R studless winter tires. 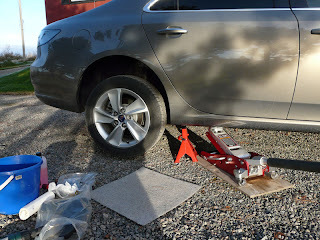 We're also allowed to use studded tires, but I chose the more comfortable, less noisy and less fuel consuming studless tires. "Nokian is just as good on ice as the Continental tire [the tire Nokian shares second place with], but slightly worse on snow. Test drivers praise the tire for a stable and secure driving feel both on snow and ice. It's good for slush and wet asphalt, and has the lowest rolling resistance of all the tires in the test. 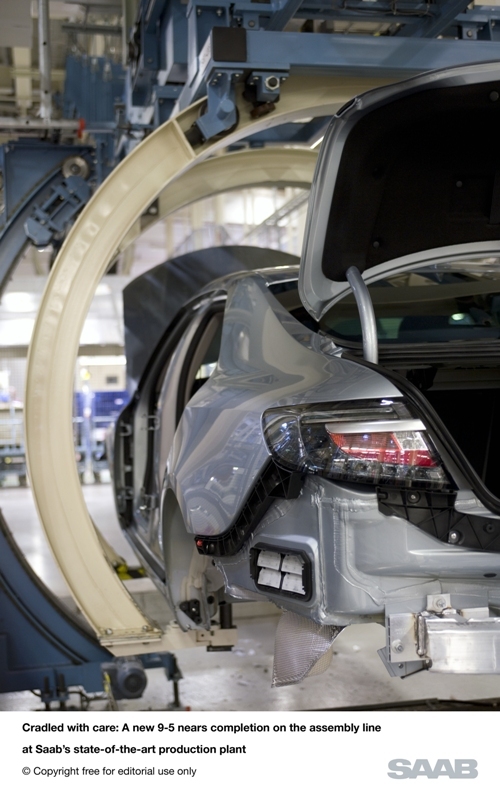 That means less fuel consumption and lower CO2 emissions. 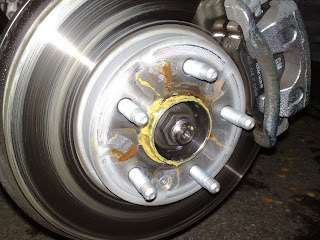 The noise from the tire is low." Update: You can read some more about my experience with these tires on winter roads here. 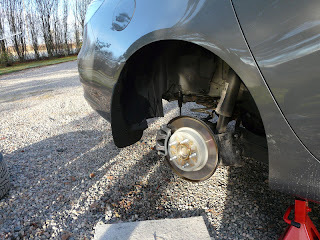 This afternoon I had a chance to test the brakes. 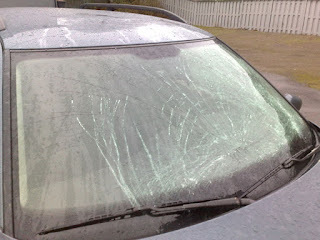 I was going 80 km/h when an old man in a Mercedes decided to drive out on the road in front of me. I stepped on the brakes and for a few seconds my tires squealed and my heart missed a beat or two. Then my car was standing still and the old man in the Mercedes didn't seem to have noticed the little drama he had created. But he did notice my car horn one second later, so I assume that he also must have heard my squealing tires. Anyway, the brakes worked great. A brake system that was developed by Saab! First I want to share with you some of my thoughts about my basis when driving a new Saab. I regard myself as a Saab enthusiast. I love the design, the ergonomics, the uniqueness, the quirks, the comfort, the sportiness and the driving characteristics of the Saab cars. 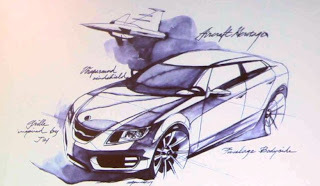 Time and time again I read reviews that compare Saabs to BMWs or Audis. 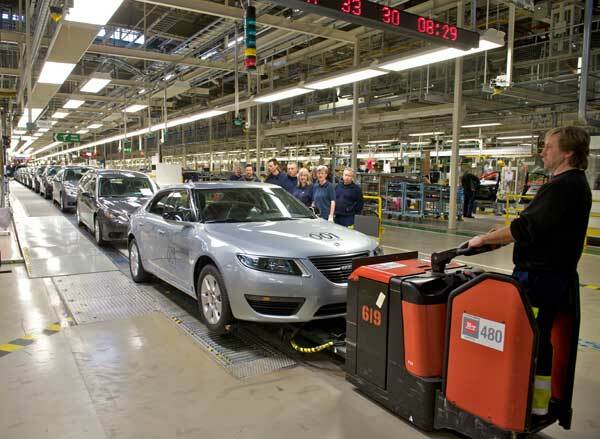 And often the Saab is said to not fully measure up to the German competitors. My answer to that is this: If I want BMW or Audi comfort, sportiness, driving characteristics etc, I will buy a BMW or an Audi! 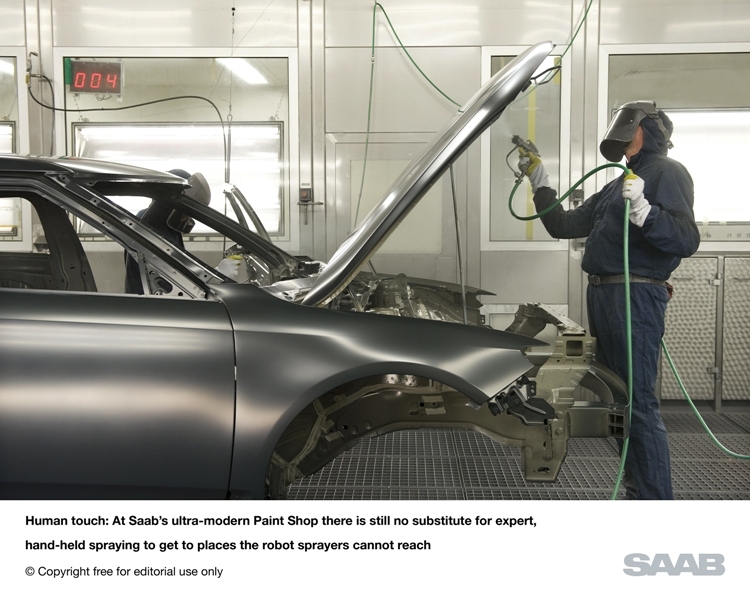 But I don't, because I want my Saab to feel like a Saab in every sense of the word. 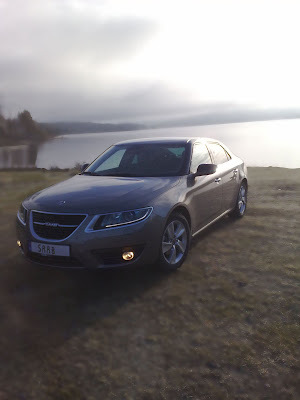 So now, when I write this very biased review of my new Saab 9-5 Vector 2.0 TiD, my main comparison is the Saabs I have driven over the years. And for me the only question of importance is this: Does this new 9-5 feel like a natural and modern evolution of the previous Saabs? When I first saw the new 9-5 I was a bit disappointed that they hadn't dared to make it even more unique and different. But as time has gone by I have started to realize two things: First, the simple and clean design is a Scandinavian tradition. We don't like to make it more complex that it needs to be. 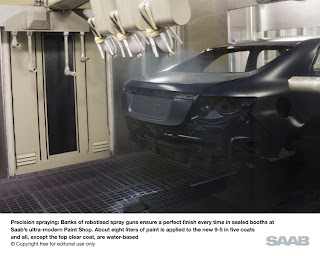 The lines of the car are very clean and natural. The design looks very harmonious. The second thing I realized was that this is a luxury sedan. Or like my father said: "It looks like an executive car." And a car like that has to have a sense of elegance and confidence. It shouldn't be too sporty or too conspicuous. 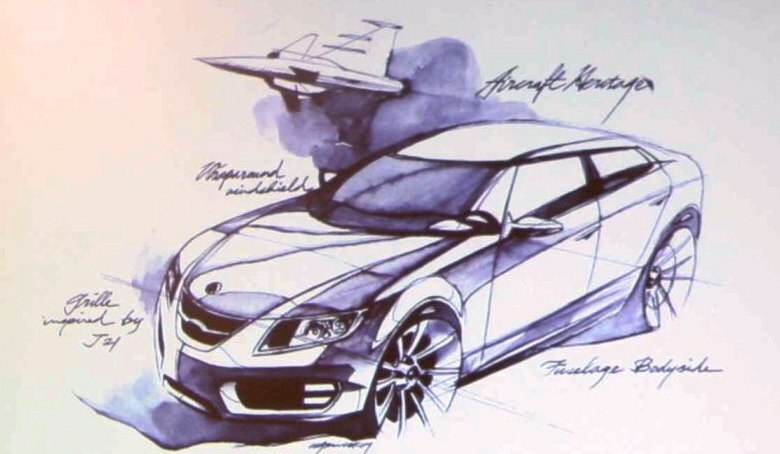 Saab can save that for the Viggen version of the next 9-3. For the 9-5 it's all about balancing on the fine line between elegance and extravagance. In my opinion, the designers have done a fine job. 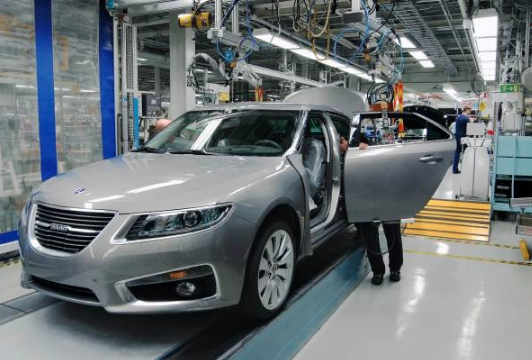 As mentioned several times by Saab and car magazines, the new 9-5 does look like a real Saab with the hockey stick roof line, the wedge-like stance, the sloping C-pillars, the shape of the headlights, the wraparound windshield and the three piece Saab grille. In my opinion this is something that distinguishes premium brands like Saab, BMW, Audi and Mercedes from the masses: A distinct and recognizable design. The interior has been one of the highlights so far. After reading some negative reviews and after I was made aware that the great looking dash panel from the show cars didn't make it into production, I was worried. I feared that the interior would be gloomy and cheap-looking. But I had no reason to worry. My car has the Dark Cocoa and Parchment interior and it looks great. The dashboard, the steering wheel, the shifter boot and the windows frame are Cocoa brown and the seats and carpet are Parchment. In between there are some details in a nice metallic look. The cockpit looks very cosy and inviting. A nice place to do some driving. My car has the comfort seats in part leather and part textile. You can adjust height and seat angle, legroom, backrest angle and lumbar support. The seats are comparable, and maybe even slightly better, than the part leather – part textile seats of the 9-3. In my opinion the seats are very good. But I am far from an expert on car seats. But for me they feel good. I know that some have criticized Saab for using a generic GM steering wheel. But that doesn't change the fact that it's a nice wheel to hold. Compared to the steering wheel of the 9-3 (both Aero and standard sports wheel), the steering wheel in the 9-5 feels smaller and gives me a sense of better control. The steering wheel is of course adjustable for both reach and rake. The buttons are okay, but maybe a mild setback compared to the ones on the 9-3 steering wheel. On my old 9-3 (MY2003) I was a bit annoyed that from my driving position the night panel button was invisible behind the steering wheel. And unfortunately this is also the case on the new 9-5. The rest of the switches and buttons seem like good quality plastic. In the good Saab tradition there are enough buttons for the wannabe pilot and it takes a bit of time to learn their placing and function. 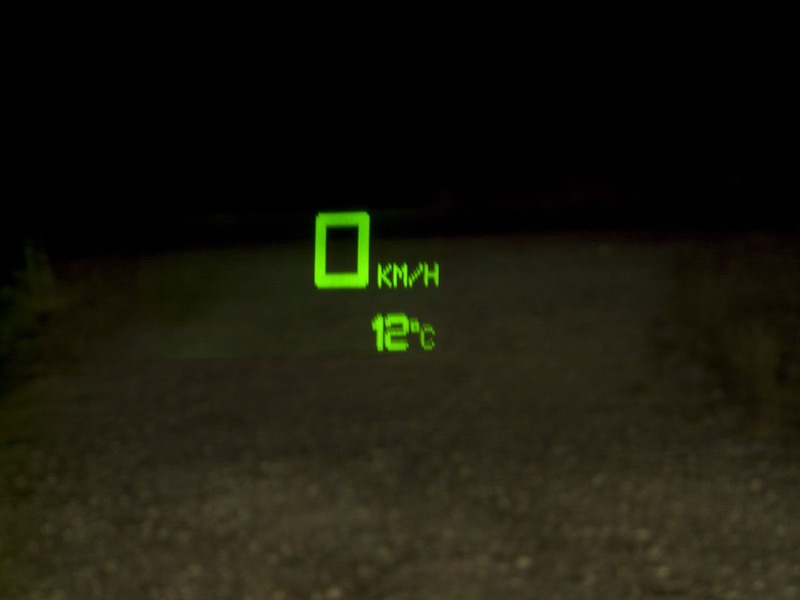 The pilot head-up display has been an ambiguous experience for me. On some drives I love it and on some it annoys me. It is very pleasing to just refocus your sight on the windshield and there's the speed info, temperature info etc. But that's also the problem. When you focus your sight and look far ahead you always have a blurred and sometimes distracting and tiring HUD on the windshield. And it can be especially distracting when driving in the dark because then the HUD is very bright compared to the surroundings. Thankfully the HUD can be turned off. I have never been much of a car stereo freak, but I love music and take special interest in actually hearing the lyrics. The seven speaker stereo system in my old 9-3 seemed adequate for my needs. But that was before I got my new car with the harmon/kardon stereo. For the first time in my live I now understand why it's desirable to also have great sound in the car. One big bonus is that it is DTS capable. Now I'm listening to DTS CDs (yes, CDs and not DVDs) with multi track surround sound. Connecting an USB-unit is plug-and-play. And copying tracks from the USB-unit or a CD over to the hard drive is hassle free. And when you put a CD (without CD-text) into the CD-player, the system has a pre-installed database of CD track lists. I am impressed! (Maybe I'm easily impressed?). 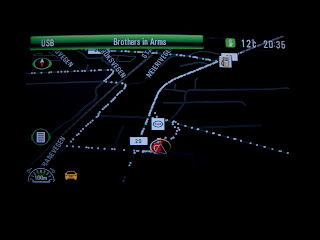 I am also impressed by the navigation. 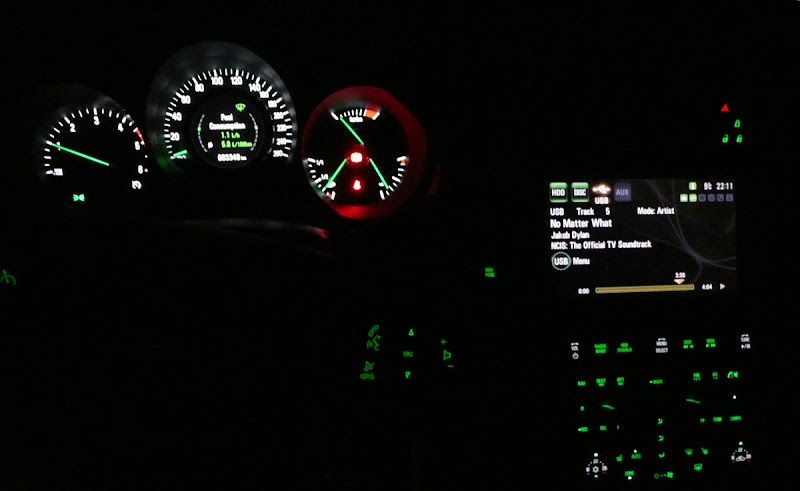 Especially how it is integrated into the HUD and into the display in the instrument cluster. The touch screen is big and easily viewable both at night and in bright sunshine. Noise: Silence is the new loud? My only complaint about noise is when the diesel engine is cold and when driving at low speeds. Then the engine is a bit noisy. When the speed picks up the engine seems to be more happy and quiet. The noise from the tires and the wind is only just noticeable, and overall the new 9-5 is much more quite than the previous 9-5 and the 9-3. 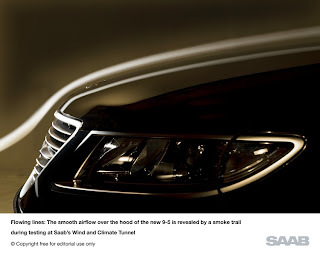 Previously I have sworn to Saab's two litre petrol turbo engines. I loved the raw power of the genuine Saab Trionic 5 engine as well as the refined power of the GM sourced Trionic 8 engine. Both went from good to thrilling with a little help from Hirsch. So I was very curious about how a diesel engine would measure up. And I have to say that I am pleasantly surprised. The diesel engine feels much more responsive than I had imagined. It feels more than powerful enough for the 1700 kg car. It overtakes both cars and long semi-trailers with ease. I haven't felt short of power yet. When Hirsch release an engine update for the 2.0 TiD, I will consider buying it, but at the moment I am happy with the performance the way it is. First of all, let me tell you about the roads I have driven on. I have driven the car to work every day for two weeks now. The road is covered with tarmac and there are fairly long straight stretches. 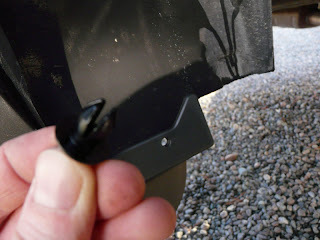 Parts of the road have a good surface and parts are quite worn by studded winter tires that have dug their way into the tarmac and created two sunken tracks. On these roads the car behaves like a charm. The worn surface of the roads doesn't seem to affect the car much and only small adjustments are needed to keep the car on track. What impresses me the most is the stability and ease displayed by the car when traveling at high speeds. There is no doubt that this is a large executive cruiser. I have also driven the car on twisty asphalt roads to my cabin in the woods, and it was a very rewarding experience to drive on the winding roads. The car steers great and feels very safe and stable when it gets thrown from one turn to another. Too bad I jammed a big bird into my grille on one of my inspired drives. 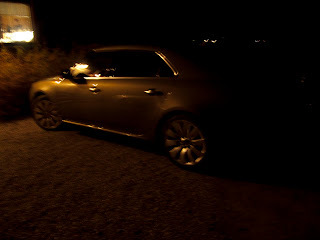 Conclusion: Go for a test drive! If you made it all the way down to the last paragraph then you should know by now that I am very pleased with my new Saab 9-5. And if you haven’t taken one for a test drive yet, then what are you waiting for? Do you want to know how the car performs under winter conditions? Then read my winter review. 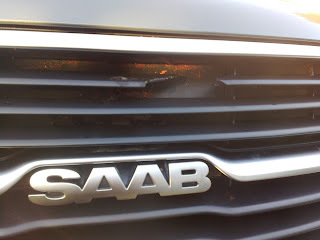 During 8 years of owning a Saab, I have learned that living right on the border to Sweden is a great advantage. Why? 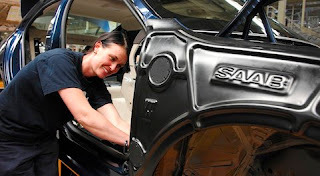 Because in Sweden you find the world's biggest market for both new and used original Saab parts and tuning parts for Saab. 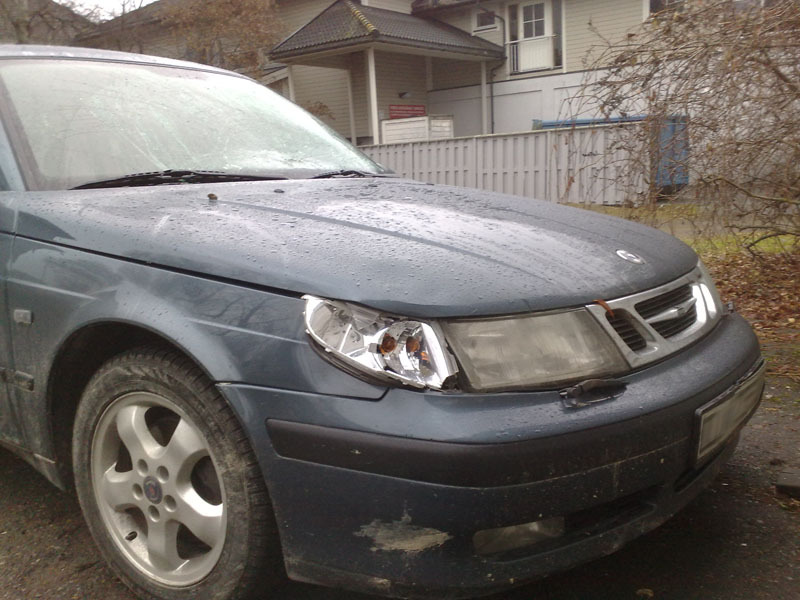 For my first Saab I bought a set of 17" Aero rims, an Aero trunk spoiler, a complete Viggen package including front spoiler, rear spoiler and side skirts, Viggen leather seats and a JR air filter. 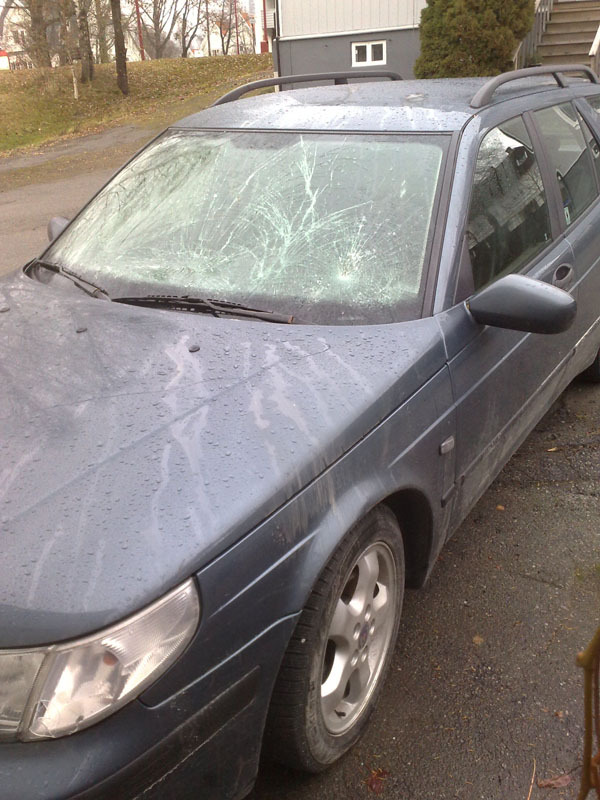 The objective: To turn an ordinary Saab 9-3 into my own special Saab 9-3. 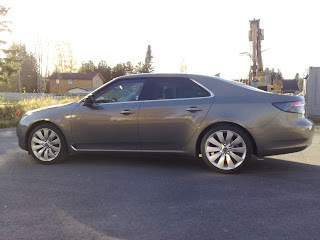 For my second Saab 9-3 I drove over the border to get some 17" Aero rims and an original Saab sport spoiler package including front lip, rear spoiler, side skirts, trunk spoiler and sports exhaust. 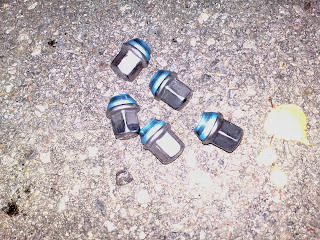 I also got some replacement parts: brake pads, brake discs and brake calipers. So by driving one hour and crossing a border, I have saved thousands of kroner. 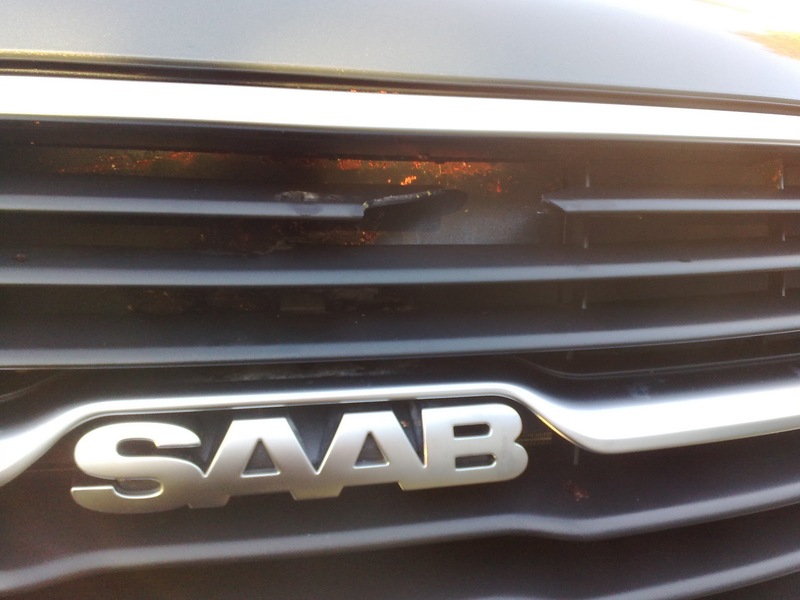 After I hit a big bird with my new Saab 9-5 earlier this week, my hopes were high when I checked the parts market in Sweden for a new grille. 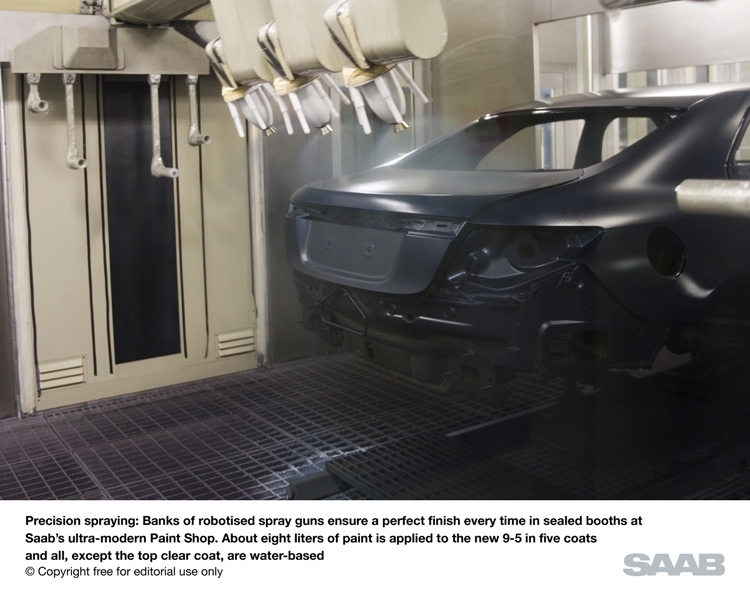 But it turns out that slightly used parts won't be available until spring next year. Okay, that's maybe not so surprising since the car was just launched. 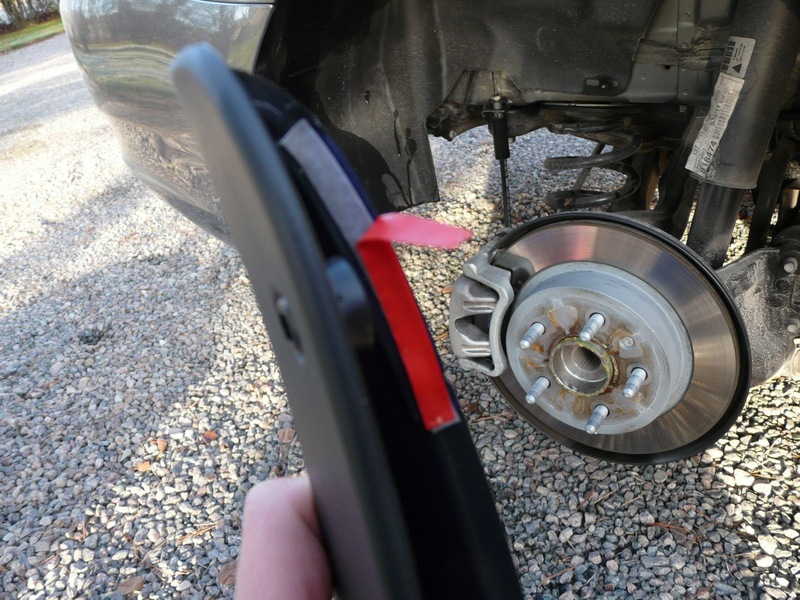 I then called the nearest Swedish Saab dealer, but for some reason he couldn't find the part in the original parts catalog either! So now I'm getting a bit worried, remembering the unlucky guy in Belgium who crashed his new Saab 9-5 and his dealer couldn't get spare parts. 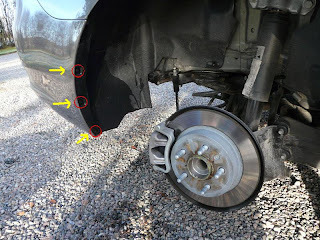 Next week I will go to the Swedish dealer to pick up my new 19 inch Turbine rims, and I hope that together we can find a new grille in the parts catalog. Fingers crossed! This entry has been moved to a page dedicated to information about the development of the Saab 9-5. That page will be updated as new information surface.